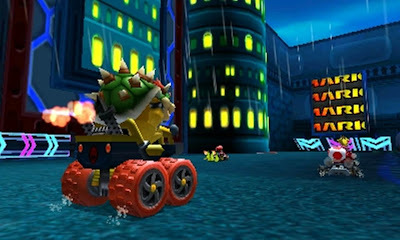 The Gay Gamer: So, what did you think of the first Mario Kart 7 gaymer night? So, what did you think of the first Mario Kart 7 gaymer night? Now that the inaugural "Mario Kart 7 Gaymer Night" is over, I'd like to ask all of you who participated what you thought of it. * the, er, "venue" (150cc, all items, etc.) that was chosen for this event. Also, if you wanted to join in on the fun but didn't due to any of the aforementioned particulars, let me know that, too. I'd really like to plan another one of these shindigs--and for sooner rather than later--but I'm not exactly sure how to go about it. Should it be scheduled it for the same day and same time as the first one, or should it be scheduled for a different day and time? Should we continue to use the 150cc community I set up a while ago, or would you prefer to use a 100cc or 50cc community instead? Also, I'd like to thank, many times over, the mysterious man behind the Video Games Made Me Gay tumblog for suggesting this little meetup in the first place. It was fun! Please keep the venue the same. Also, I think you should promote the community on Twitter every other day or so, so more players can join. The more players means more races! Thanks for hosting! Not sure who you are, anon, but I'm glad you had fun! So did I :) As for promoting the community every day: I'm not sure about that, as I don't want to flood Twitter or anything. Maybe I'll mention it every few days, though, or at least once or twice a week. Anyway, thanks again for taking part! I was only able to fully join in almost 90 minutes late due to 3DS/WiFi issues I won't elaborate on, so those who participated in the last half (things pretty much fully petered out close to 10:00 PST) will remember me as the guy they were grateful to have there to consistently come in last. But if you do it again, regularly or occasionally, I'm up for it. Being on the West Coast, 7 PM or later is good for me. I'm more of a 100 cc competitor, but I don't have a real problem with 150; if anything, it'll make me a better racer! And thanks to all I raced against for not choosing Maka Wahu. I always sigh to see it selected, as I don't want to cheat, but neither do I want to see that one cheater (there's always at least one) win the race while the rest of us bask in our righteous loserness. It raises ethical dilemmas that I would rather avoid while playing Mario Kart. Hey there, David! Sorry you had issues with your 3DS/WiFi connection. Hopefully that won't happen next time. I'm glad you had fun all the same, though -- and I'm sorry I didn't get to play with you. I had to bow out after three cups/groups, unfortunately. We'll definitely do it again, by the way, and hopefully on a somewhat regular basis. I'm not sure once a week would be a great idea, but maybe every other week? Of course, the community's always open, so folks can always pop in when they're on line and see if others are around. Anyway, I can't imagine scheduling one of these 'gaymer nights' for earlier than 7 pm PST, as it would be too early for most of us on the west coast, so no worries there. I like the idea of starting a 100cc community, but I wonder if that would splinter the group too much? Maybe it should be something I add down the road, after these events (hopefully) have gained more of a following. I jumped in when I saw you guys on my friend list, as I didn't know what time it would be over here in Australia (I think it ended up being around 7 or 8pm AEDST). In the end, I came last in all races -_-"
Hello there, diaglyph! Thanks for participating last night and for sharing your thoughts on the whole things here. Sorry you came in last all the time :( I have to admit I cringe every time someone picks one of the Rainbow Road tracks myself, so you're not alone there. As for starting a 50cc and/or 100cc community: I'm seriously considering it. Like I said in the comment above, my only worry is that it'll splinter the group. So, let me think about it a bit, OK? I'm planning to bump up the promotion of the 150cc community in the coming weeks thanks to an earlier commenter's suggestion, though, so maybe if more people start using it -- and show up to these gaymer nights -- I can add a 50cc and/or 100cc option down the road. Anyway, thanks again for taking part and especially for sharing your thoughts. I appreciate it! That's cool :) I understand. I'm just starting to think that perhaps Mario Kart in general is not for me anymore. Anyways, you guys have fun ;) I'll read up on how your races go! If you do make a 50cc community I'll give it a go, but I think I'll give the 100cc/150cc communities a miss. Aw, sorry about that, diaglyph :( I certainly hope you don't give up on MK7, although I guess I can understand if you do if you just don't enjoy it. Did you like earlier Mario Karts, by the way? Anyway, I'll definitely let you and everyone else know if I start a 50cc (or 100cc) community. I've had fun on previous Mario Karts. Perhaps Mario Kart SNES was the most fun I've had. But note: all of those, starting from SNES, (I forgot to mention the N64 Mario Kart too) I played on 50cc. As soon I tried playing 100/150cc (any Mario Kart game) I would lose interest in the game as I found it way too difficult (not to mention the cheating AI). With the recent online play for Mario Kart, it only showed me how much of a crap player I really am! I'm constantly amazed at how much further on the track everyone seems to be compared to my position, how everyone zooms pasts me, they hardly ever fall off or when I bump into them I tend to be the one knocked off or spun out. Well, then, it definitely sounds like playing Mario Kart at the 100/150cc level just isn't your thing, then--which is certainly OK. Do you ever play in any of the "official" (set up by Nintendo) 50cc communities? If so, have you had a better time doing that, or was it still frustrating for you? Sorry for asking so many questions. I'm just curious. Are there 50cc communities? Never really noticed, I just assumed they were all 100/150cc.... Just had a look now, there is a 50cc Ninty community "Let's Play". I'll try that out and see how I go. Oh, yes, there's definitely a Nintendo-sponsored (for lack of a better word) 50cc community. It was the first one I played when I went on line with MK7. There should be plenty of people in there for you to race, I would think. As for what you're choosing: Miis are mid-weight, I believe, so that's good. You could choose different wheels or karts, though, to help with spinning out, though -- or at least I think that's the case. Sorry to hear you ended up in last place even in Nintendo's 50cc community, by the way. I'd tell you to keep at it but, really, it's up to you. If you don't enjoy playing on line, there's nothing wrong with just racing against the computer or playing something else. I had a blast! And the one race where Maka Wuhu was picked, Robb picked it. I poked him and went, "Now everyone's gonna think you're a cheater!" And he was horrified. But no one cheated. So that's good. I kept a close eye on it. We're a good bunch. I liked the time and the day. I'd be up for almost any weeknight but Wednesday or Friday. As far as the CCs, I think that when racing human competitors, 150 is just as balanced as 50cc. It's just faster, which I appreciate. Ah, I didn't realize that, Justin! Honestly, I always forget which one is the one that can be cheated on. I know it's one of the Wuhu island ones, but that's about it. I didn't even think about it until this morning, when someone else mentioned it here. Thanks for sharing your thoughts on the day, time, etc., by the way. I have a feeling I may make the next one be on Monday again, just because this one seemed to work out so well. Friday especially seems like a bad night for most folks, and I'm not sure people would want to race on the weekend either -- although I'm open to anything, really. As for 150cc vs. 100cc vs. 50cc: I'm with you. Personally, I don't much like 50cc or even 100cc because they just seem to slow to me. I understand and appreciate that others find 150cc too fast, though. Oh, and good for you for being in front for so long! How many stars do you have, BTW? I can't remember. And how about Robb? How did he do last night? I would love to join in next time! My only issue is.. I don't own the game yet. :D But I will let you know when I do buy it and have played it a while. I loved it. There's something about the sense of community that's so much nicer than strangers. On the other hand, I played like a dumbass. So there's that. Yeah, Drew. You and I were neck and neck for a lot of races! I thought you were my racing nemesis! Aw, this is great to hear--and it makes me want to get out there again! Maybe we should plan another for next week or the week after?? I guess I'm just spoiled by soundly beating the computer... and then realizing that humans are wilier than computers.